Is sitting down at the negotiating table scary? Not sure how to strike the best deal? Let’s take the mystery out of negotiations and develop the confidence to achieve the best possible agreement. 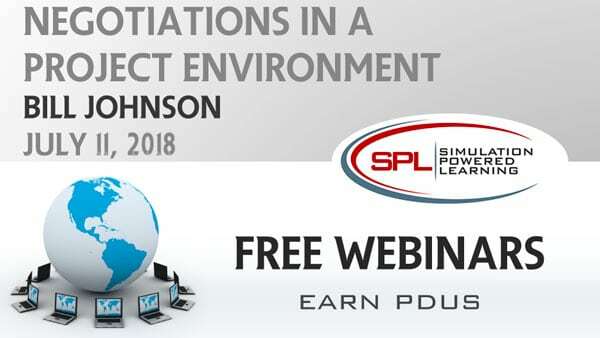 This webinar will look at the various tools and techniques that will help ensure success at the negotiating table. It will begin with a look at the theory behind negotiating and its various strategies. Followed by a look at the three styles of negotiators along with tactics that they employee. It concludes with a look at how culture impacts negotiations, and how this all is incorporated into project management. Join us for a highly informative and engaging look at removing the mystery around negotiating. Exploring the theory behind negotiations and its various strategies. Finding out the various styles of negotiators and their tactics. Looking at how the culture of various countries impact negotiations. Discovering how and when various strategies, styles and tactics should be used in project management. Bill Johnson, PMP, MSPM, is a project management consultant and educator. He is an Adjunct Professor and Teaching Fellow at St. Mary’s University of Minnesota in the Project Management Masters Degree program. He has 15 years as an independent project manager and consultant where he has worked for clients including American Rhodes Trust and The State of Minnesota. As a contractor, Bill has extensive experience negotiating with fellow contractors and clients alike.